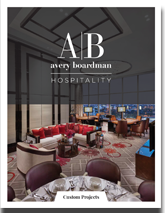 Robert A.M. Stern Architects is pleased to announce a new licensing agreement with Design Furniture Holdings Inc. (DFH), the luxury custom furniture manufacturer of the Ferrell Mittman and Avery Boardman brands. The partnership, which brings together a firm known worldwide for its contemporary interpretations of traditional forms and a manufacturer committed to craftsmanship and customization, expects to introduce two collections in 2019. "The cosmopolitan yet distinctly American approach of Robert A.M. Stern Architects, forward-looking yet rooted in history, is a perfect match for our made-in-America furniture and case goods," said Ira Glazer, owner of DFH. "Ferrell Mittman and Avery Boardman have long been go-to firms for our designers, who appreciate their dedication to quality, comfort, and top-notch design," said Alexander P. Lamis, FAIA, Partner at Robert A.M. Stern Architects who manages the firm's product design and decorative arts program. "Together we look forward to offering handsome, well-executed furnishings both for our projects and the wider design community." Robert A.M. Stern Architects was represented in the negotiations by Design Commerce Agency, based in Fairfax, California. Robert A.M. Stern Architects has designed contract and consumer furnishings since the early 1980s. The firm's current product lines include site furniture and lighting for Landscape Forms, tile for Walker Zanger, carpets for Atlas Carpet Mills, doors and paneling for Lualdi, lighting for Remains Lighting, cast-stone garden ornaments and mantelpieces for Haddonstone, fabric for Stinson, architectural hardware for SA Baxter, and contract furniture for David Edward. DFH is a holding company created by Ira Glazer in early 2018 to own the assets of Ferrell Mittman and Avery Boardman. The company is complementing its case goods offering with exciting new designs while continuing to be the leader in fine upholstered seating. Every aspect of the business, from artisan craftsmanship to world-class customization, is supported with personalized service to ensure designers are provided with the best possible experience, with the goal of being the most trusted, highest quality-to-the-trade brand in the industry. Ferrell Mittman and Avery Boardman are distributed through company-owned showrooms in New York, Chicago, and Dallas as well as numerous representative showrooms throughout the U.S. For more information, see Designfurnitureholdings.com. Design Commerce Agency was founded in 2014 to re-craft the design licensing business model for the twenty-first century and apply it to the luxury interior design and home furnishings markets. DCA's designer clients are many of the best interior and home furnishings designers in the world, and DCA seeks to provide the very best design licensing opportunities possible for them with leading retailers and manufacturers. More information is available at Designcommerceagency.com and on leading social media at @DesignCommerce.